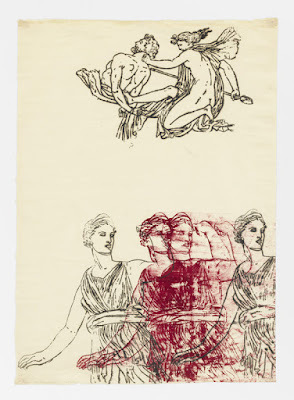 Tom Holmes’s New work combines aesthetic modes that seem mismatched at first, blending the corporate brashness of commercial design, the subconscious expression of automatic drawing, the pared-down forms of Minimalism and the silvered surfaces of Warholian Pop Art. 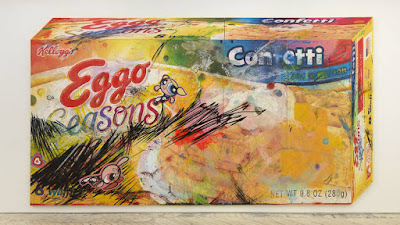 In the two large canvases from which Holmes’s third show at Bureau derives its familiar title (“L’Eggo My Eggo®”) waffle boxes look as though they were attacked by a finger-painting infant in the throes of a sugar high, while in the three accompanying sculptures, house bricks and folding chairs get glamorous, reflective veneers. The arist, who lives and works in Tennessee, collaborated with a hypnotist to achieve the seemingly uninhibited scrawls of paint and ink that partially cover his canvases, evoking comparable exercises by artists from Robert Rauschenberg and Kelley Walker to fellow automatist Matt Mullican.